Is natural gas really better for the climate? This may seem like a simple question. After all, natural gas is the cleanest burning fossil fuel. And data from the Energy Information Administration in April showed a downward trend in U.S. energy-related carbon dioxide (CO2) emissions. A move many experts believe is largely attributed to the increased production of U.S. natural gas and the shift it has caused in the power sector – old, dirty coal plants being retired because new natural gas plants are more competitive. But, this is only part of the story. Natural gas is comprised primarily of methane, and unburned methane is an incredibly potent greenhouse gas – 72 times more powerful than CO2 over the first two decades it is released. The oil and gas industry is one of the largest domestic sources of methane, and while new gas reserves are being drilled every day, too little is known about how much and from where methane is leaking out from across the natural gas system. Lack of direct measurements has been a challenge, as EDF’s Chief Scientist Steven Hamburg explains here. The need for better data to understand and control methane emissions in order to understand the true climate opportunity of natural gas led to EDF’s largest scientific research project. This effort currently involves about 85 academic, research and industry partners subdivided over five areas of the value chain (production, gathering and processing, transmission and storage, local distribution and transportation). Yesterday, EDF and its partners for the natural gas transmission and storage sector kicked off the fourth module of this collaborative research series. 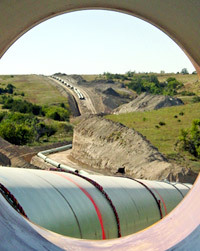 It focuses on the segment providing the infrastructure for the nation’s interstate pipeline systems and storage facilities and that is responsible for delivering natural gas to regions around the country for electricity, as a feedstock for industrial development, heating, etc. Led by researchers at Colorado State University, we expect to learn a lot about methane emissions associated with natural gas transmission and storage sources, including compressor stations and underground storage facilities. Industry participants providing access to their facilities and equipment for testing (CenterPoint Energy, Dominion, Kinder Morgan, TransCanada and Williams) collectively represent a significant slice of the market. Dow Chemical and the Interstate Natural Gas Association of America are also sponsoring the study. It is yet to be determined whether the switch from coal and oil to natural gas will be a net benefit in the context of climate, as estimates of total methane leakage vary widely (1 – 9 percent). Direct measurements at the source of methane emissions across natural gas operations are essential to help answer these questions. This is the value of hard data and our journey with independent researchers and companies to gather the data that can advance methane science continues.